Input devices, such as keyboard, mouse and touchpad are very important in terms of computer ergonomics. I recommend choosing the ergonomic input devices very carefully. These are the main tools with which we physically interact while working at the computer. And the overall comfort of work depends on the comfort of this interaction. Input devices should not only be ergonomic, but also functional and aesthetic. Programming keyboards that have a division of the keys into two blocks - for each hand, are very comfortable. These blocks should be rotated. The position of the hands on such blocks is more natural, which significantly reduces the pain in the wrists. The next important thing is the presence of a wrist rest pad. Pay attention to the pad material - it should be pleasant to the touch. The height of the buttons is also important. The smaller the height is, the less effort it takes to press. And also pay attention to the keystroke softness. And one more important parameter is the presence of a wireless interface. This is especially important if you like working in different positions. Get rid of cluttering wires! 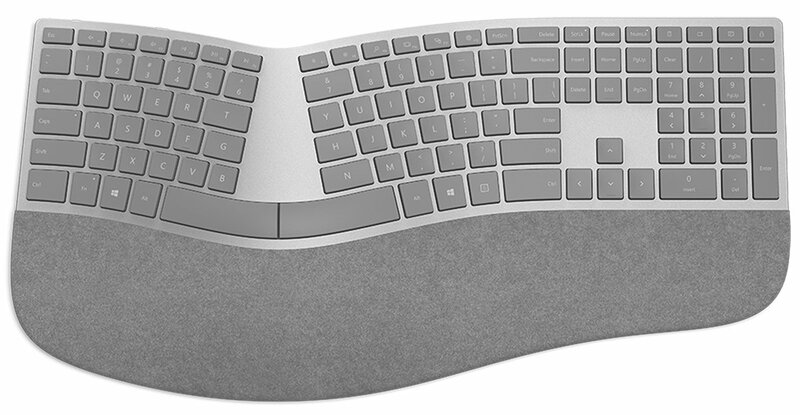 The model is almost identical to Microsoft Surface Ergonomic, but more compact due to the separate number pad. In fact, this pad is not so often used. Most often it is used if you need to enter a lot of numbers in applications such as a calculator or Excel. I think that it's a big plus. People who enter many numbers will be able to choose the right place for it on the table. Others can refuse it altogether. I personally barely use it. But the benefits of a compact keyboard is undoubtedly greater. The keyboard is designed primarily for working with Windows, but also works fine with the Mac. 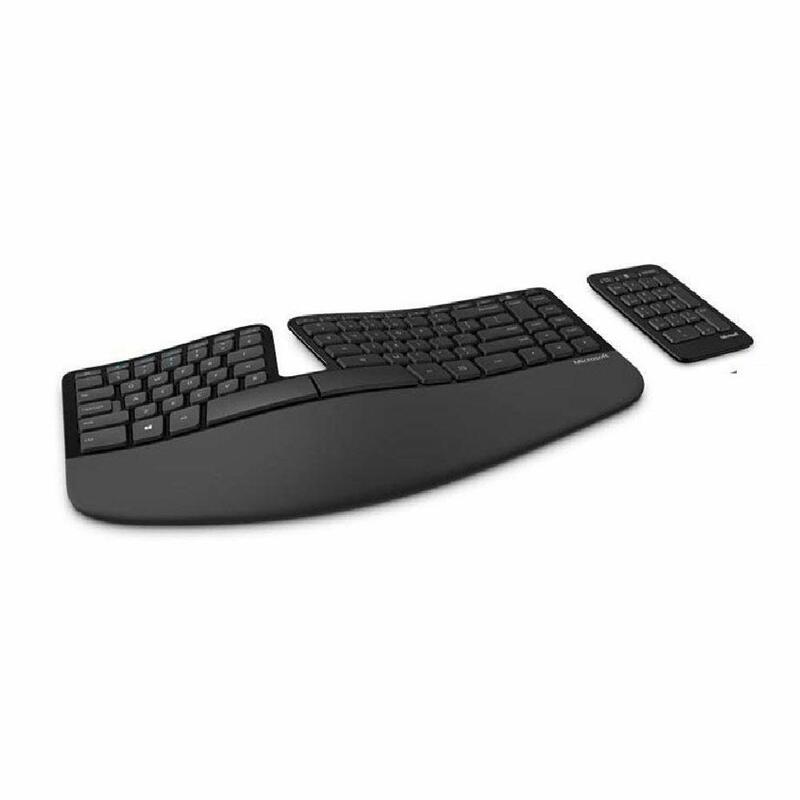 Excellent wireless keyboard with a small height of keys and a convenient wrists rest pad. It does not differ much from the model that took first place, but lost to it due to a slightly larger size and due to the number pad presence. Very comfortable keyboard with a soft pleasant wrist pad, good ergonomics and multimedia buttons, but there are a few not very pleasant moments: - it's big and heavy. - not wireless - a large height of the keys, some keys are really large. Pressing is not very soft. 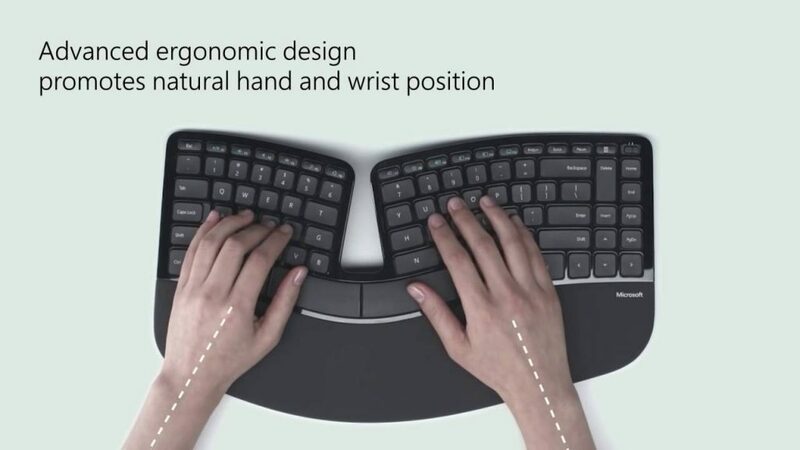 Comfortable ergonomic keyboard divided into two blocks. Many users prefer this particular model. It has reliable buttons mechanisms. Of the shortcomings, I would note the high price and unusual location of the keys. It takes time to get used to such a layout. You may be surprised that macbook users rarely use a computer mouse, preferring the built-in touchpad. And this solution has a lot of advantages. But since we review the devices primarily because of ergonomics, the built-in solutions do not interest us. Instead, we are considering external solutions that would work in conjunction with an external keyboard. I strongly advise you to look at the external trackpad Apple Trackpad 2. Undoubtedly, it looks great in the interior. Clicking is mostly done with a touch, which means that you will not be annoyed by clicks on the mouse buttons. There are much less movements of the hands while doing this, than when using the mouse. Movements occur most often because of the fingers. Also, you do not need to make an effort to click. You can also easily use both hands (alternately), what will improve your brain activity by using the other hemisphere of the brain. Scrolling pages is very convenient implemented, it works very smoothly. The trackpad supports many different gestures. Due to this, it is very convenient to work with apps and windows. No mouse can compare in this. Of course you'll have to get used to it, but after two weeks you will no longer want to use the mouse. If I did not convince you, then watch this video. PPS: Haven't read about a computer desk or desk location and light yet?